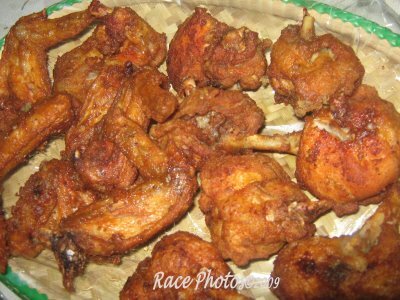 My kids love fried chicken and fried pork chops but my Mom told me that fried foods are hard to digest so what should I do to make it easy for digestion. Of course I don’t want my kids to suffer indigestion after eating their favorite foods. The technique is to absorb less fat and to do it foods should be fried in hot deep fat to avoid absorbing too much fat. Remember to fry chicken, fish, tapa, meat, eggplant and some others on hot deep frying oil to make them easy to digest. If performed properly, deep-frying does not make food excessively greasy, because the moisture in the food repels the oil. The hot oil heats the water within the food, steaming it from the inside out; oil cannot go against the direction of this powerful flow because (due to its high temperature) the water vapor pushes the bubbles toward the surface. As long as the oil is hot enough and the food is not immersed in the oil for too long, oil penetration will be confined to the outer surface. However, if the food is cooked in the oil for too long, much of the water will be lost and the oil will begin to penetrate the food. The correct frying temperature depends on the thickness and type of food, but in most cases it lies between 175 and 190 °C (345–375 °F).